Linde Carr, Notting Hill Housing board member, has already been featured on this blog. She told me she was going to see Dior and I with her daughter so I asked her to review it. I remember the first time I arrived in Paris as a young fashion student I felt that I was in heaven. It was the mid 70’s and like the youth of every generation we felt we were the experts and the traditional fashion houses were old hat and to be tolerated or worse to be smirked at. We were taken to a show at the House of Dior and it makes me cringe now at how ungracious we were looking at the garments with derision. They were beautifully made but very boring to us. Only now do I appreciate that they were put together so beautifully that they were works of art in their own right even if not to my taste. It is strange how age makes us more tolerant. If only it were the other way round.I do remember walking into the salon and looking at the gilt chairs which had seats the size of a tea plate. They were tiny even for me who was a size 8 at the time. 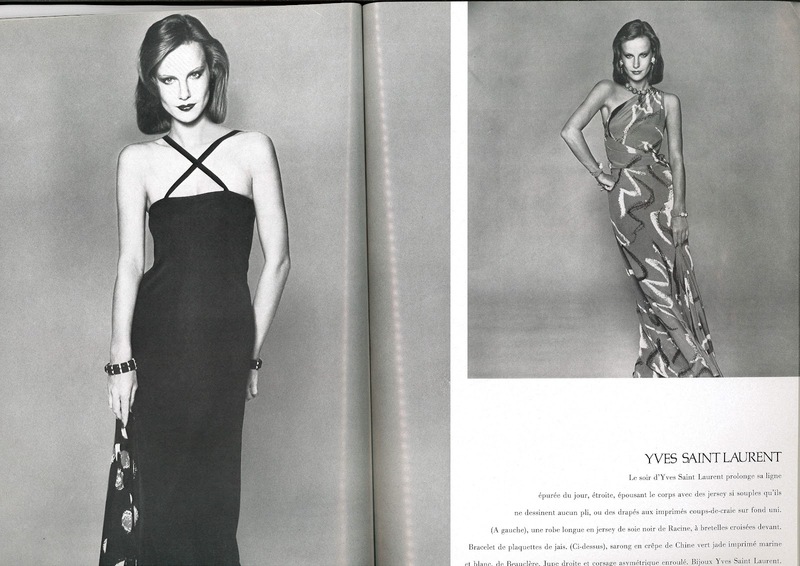 Up until the present day I have never seen models as thin as the ones at Dior, so gaunt they weren’t even attractive. The reason for my reminiscence was that all those feelings from 40 years ago came back the day I went to see the film Dior and I. I think you need to be a fashion anorak to understand what I am getting at. To anyone who has not been involved with fashion I promise you the anticipation and build up of excitement that is portrayed in the film is 100% correct. Behind the scenes of Dior is as real as it gets. It is hard to explain to an outsider that the tiniest of details such as the size of a cuff or the way a scarf hangs is a life or death issue. The colour of a blouse under harsh lighting or the size of a bag with a jacket is more important than any political matter. All these issues are major to the House of Dior. It is another world. All of this was brilliantly documented in the movie. It showed the ladies who work in the back office live and breathe Dior. It is their very reason for living and even though a number of them are certainly not slim it is their quest to make sure these emaciated models carry the garments off to their very best advantage. The back room ladies are more like a flock of lab technicians as they walk around in their white coats the look which has been copied by Clinique. Their whole world is very small and to them it’s not a garment it is their baby. The film portrayed the intensity of their world so well that I came out of the movie feeling that I had been part of the roller coaster ride to the catwalk. I would recommend it to anyone who has any connection with fashion or loves that world. To anyone else I think it would seem rather passé to get so het up over a bolt of cloth and I doubt they would enjoy it. I loved it with a passion. I have to confess I went to see it again last night!! By the way I do like your new heading ,the colours are good. I may give this film a go, if I get the chance. I really enjoyed reading ‘The Pink Suit’, the fictional account of Jackie Kennedy’s iconic suit and would probably watch a film based on that too. Although in fact I’d rather be doing it than watching it. Love your new look! I will definitely see this as soon as it’s released here in the US. Thanks for the review. It sounds like a must for any sewer. I also love your new blog look. This is a must see for I! Thanks for the review. Went to see this yesterday so was thrilled to find this post in my inbox. You’ve fleshed it out the world it portrays considerably for me and to some degree allayed my concerns for everyone’s mental health that I felt on coming out of the cinema. This is a great post by Linde. I loved having the historical “fashion insider” view and reading the honest comments about how she saw things as a young fashion student. I am sure that we all have memories of responses we had to things that make us cringe now (I sure do!). I suspect we generally become more tolerant with age because if it were the reverse no one would take care of us. 🙂 Will definitely have to see this film if it makes it to my neck of the woods.